To request a Mass Intention, please contact the parish office at (916) 443-8084 or info@stfrancisparish.com. 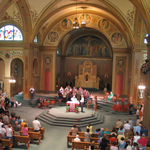 Personal hearing devices are available to assist those attending liturgies at St. Francis. If you would like to use one, please see an usher for assistance. 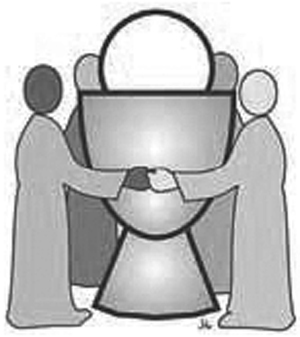 We offer a low-gluten communion wafer at our weekend liturgies for those who observe a gluten free/low gluten diet due to medical reasons and are therefore unable to receive communion in the usual form of bread/wafers. In 2003, the then Cardinal Ratzinger, as Prefect of the Congregation of the Doctrine of the Faith, issued a document stating that those who are alcohol intolerant (not only the priest presider at Mass, but also the lay faithful) may share in the fullness of the Eucharist. They may share not only in the Body of Christ, but also in the Blood of Christ, through the use of mustum (wine from which the alcohol has been removed). In September 2015, Bishop Soto approved a request from our Pastor to distribute mustum, but on a trial basis, as it is a new practice in the Diocese of Sacramento. This cup is distributed next to the Extraordinary Minister of Communion who offers the Eucharist for those who are gluten intolerant (at the pillar to the right of the altar). Fr. Des asks that you let him know if you wish to receive from this cup, as that is one of the guidelines for the practice. In line with our mission statement, St. Francis Parish is seeking to meet people where they are, responding to their pastoral needs, including rather than excluding those who are otherwise unable to fully share in the Eucharist for reasons of health and well-being.